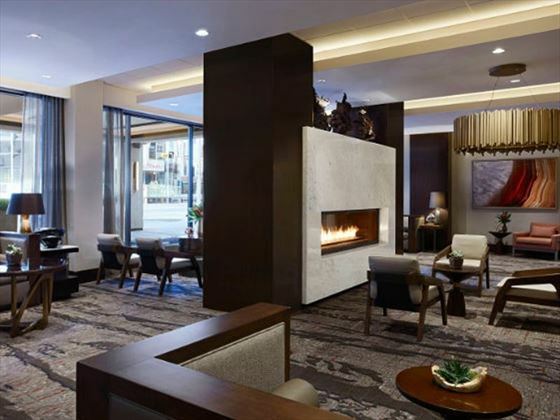 The Calgary Marriott Downtown was recently renovated and sits in an ideal location for easy access to popular business venues like the TELUS Convention Centre, restaurants and shops, as well as outdoor adventures in the Canadian Rockies. 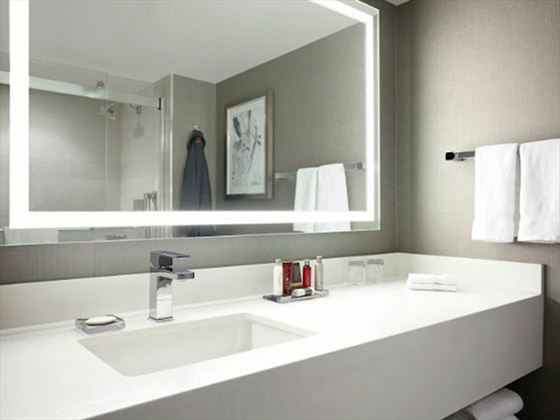 Guests can look forward to upscale, spacious rooms with views of the Rockies or the city skyline as well as plenty of modern amenities and taking advantage of the wealth of facilities onsite. 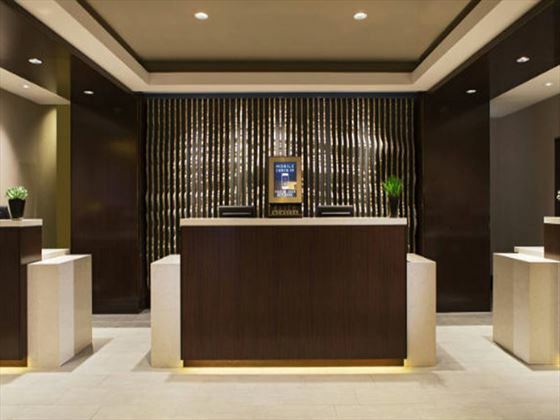 Get energized for the day by working out in the fitness center and fueling up at the onsite Starbucks and breakfast buffet. 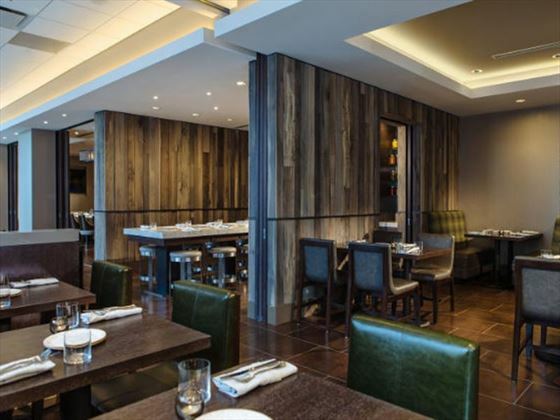 After working or playing hard, you can enjoy a refreshing swim in the indoor pool and feed those hunger pangs at ONE18 EMPIRE, the property’s restaurant which serves creative Canadian cuisine and hosts a stylish whiskey bar. When it’s time to return to your room, relax on a comfy pillow-top bed and enjoy the pay-per-view movies available on the flat-screen TV. No View Guest Rooms – The 327-square-foot standard No View Guest Rooms include either one king-size or two double-size beds and all standard amenities. Limited View Guest Rooms – These 270-square-foot rooms include one king-size bed or two double-size beds along with a limited view and all standard amenities. 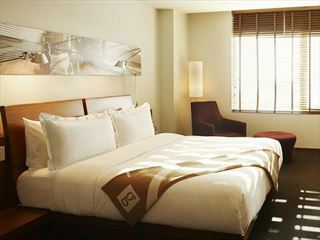 Double Guest Rooms – These 270-square-foot rooms include two double-size beds along with all standard amenities. Deluxe King Rooms – The Deluxe King Rooms have 270 square feet of space and offer a city view along with a king-size bed and all standard amenities. 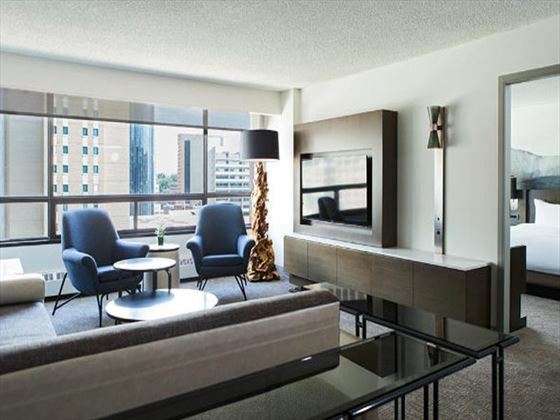 Larger Corner Guest Rooms – These corner rooms contain 413 square feet and offer a view of the city and Stephen Avenue along with one king-size bed and all standard amenities. 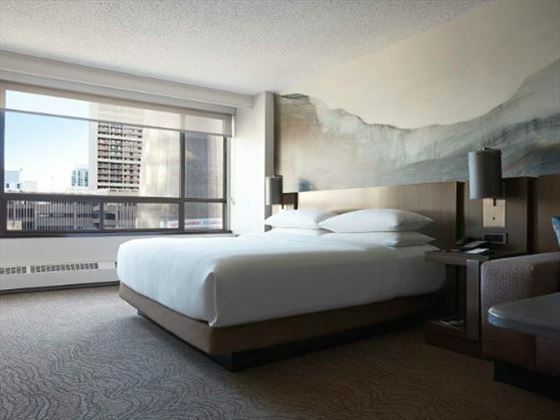 Larger Guest Rooms – These 318-square-foot rooms offer a view of the city and the Bow building and include one king-size bed and all standard amenities. M Club Lounge Access Rooms – These 384-square-foot rooms sit on a high floor and include a sitting area and a king-size bed, along with a limited view. 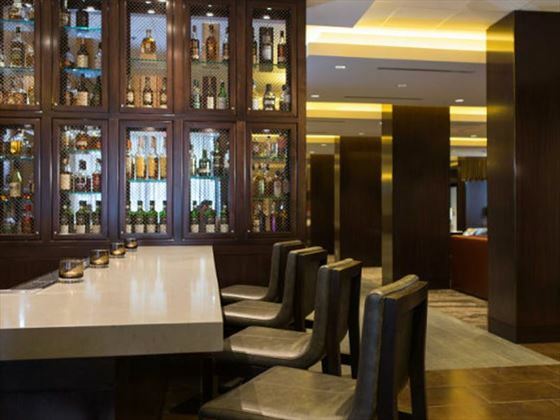 They also provide access to the M Club Lounge which serves a complimentary breakfast buffet, midday snacks, hors d’oeuvres and non-alcoholic beverages, as well as cocktails and an a la carte menu for a fee. M Club Lounge Access with Skyline View Rooms – These 384-square-foot rooms offer M Club Lounge access, a view of the city skyline and a king-size bed. One-Bedroom Suite Rooms – These 750-square-foot rooms include a bedroom and separate living area with a sofa and chair, along with a city view. 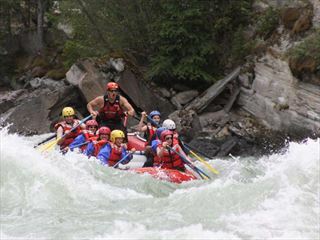 The hotel offers a hot breakfast or grab-n-go breakfast for a fee, and also hosts the ONE18 EMPIRE restaurant, open for breakfast, lunch and dinner as well as housing an impressive whiskey bar. 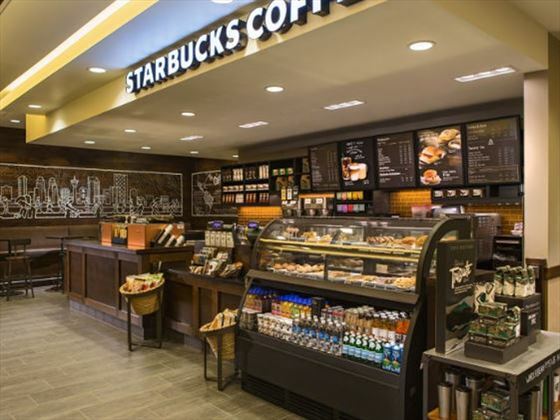 A Starbucks Coffee House is also onsite, serving a variety of coffee and tea beverages, pastries and snacks. 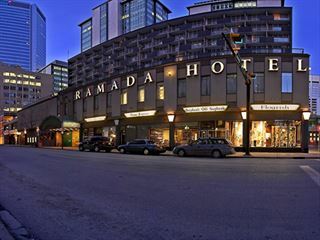 This property is located in downtown Calgary, next to the Calgary Tower and Glenbow Museum. 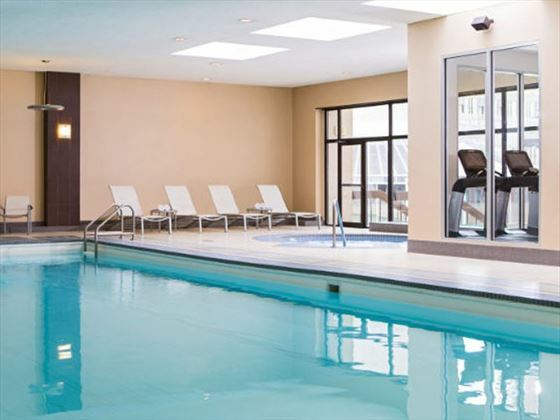 CORE Shopping Centre, Devonian Gardens and BMO Centre are less than a 15-minute walk away.